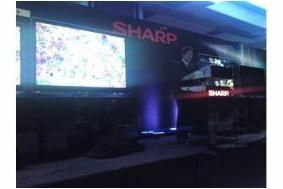 CES 2010: Sharp introduces flagship Aquos LED TV, but no 3D models until 'end 2010' | What Hi-Fi? Instead, it's focusing on its new QuadPixel technology - which adds a fourth colour, yellow, to the traditional RGB (red, green, blue) – for even sharper, brighter images. And LED-backlighting will be a mainstay of its TV range, with the company expecting 50 per cent of the models it sells in the US this year to be LED equipped. Flagship of the new LE series is the Aquos LE920, which is just 1.6in deep and features a Full HD X-Gen panel with edge-llt backlighting. It's also equipped with AquosNet web connectivity using Netflix and Twitter widgets, plus AquoMotion 240 processing to reduce blur. We'll have more on this and the forthcoming LE820/LE810 models, and the rest of the Sharp TV and Blu-ray range, shortly.